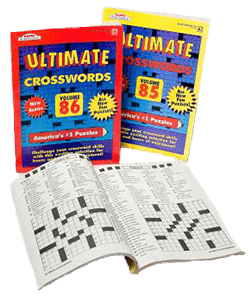 Some things exist for quite a while before they erupt into a full-blown fad — such was the case with crossword puzzles. The first known published crossword puzzle was created by Arthur Wynne on December 21, 1913 and he is usually deemed as the inventor of the popular word game. One of the fans of the puzzles was the cousin of Richard Simon. Simon and his business partner Max Schuster owned a small three-person publishing company that would soon become Simon and Schuster. Because his cousin enjoyed the puzzles so much, Simon sought to put together a compilation of the puzzles in a book. Simon and Schuster quickly arranged a meeting with the puzzle editors of the New York World and they agreed to put together a collection that was printed in 3,600 copies of the book. Although rejected by many book dealers early on, they eventually caught on and demand for the book exploded. Soon crossword puzzles books popped up everywhere, sometimes in other languages and often with a particular subject matter theme. As a side note, the sale of dictionaries and thesauruses exploded with the emergence of the crossword puzzle and the collective average IQ probably increased as well.